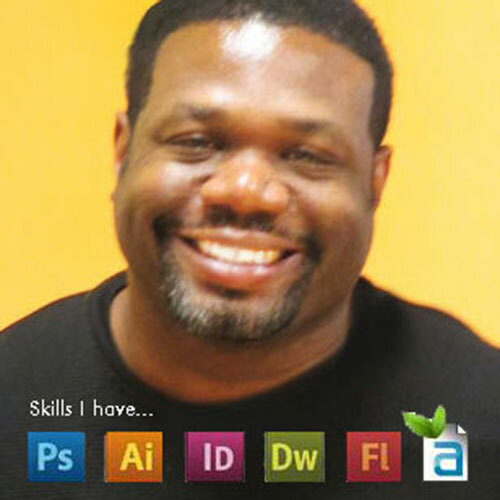 “I’m currently the Visual Designer for Allstate Insurance. I design app icons and interactive design concepts for iphones, ipads, androids, web pages, intranet services and print. The Creative Suite 6 programs I design with are Photoshop, Illustrator, InDesign, Dreamweaver and Flash. I collaborate with brilliant iOS Developers, Programmers, Interactive User Architects that design mobile and ipad apps as well as laptop & desktop software solutions that are engaging and useful to solving a problem. My creative design skills and wire framing knowledge of UI – UX talents helps Allstate Innovative Research & Development Team captivate and engage today’s consumer thru mobile devices, webpages, social networks and other interactive media components along with print.